The expansive title of Vaughn Nelson’s Wind Energy is appropriate as Nelson delves into such taboo topics as population, exponential growth, and exhaustion of fossil fuels. For example, in Chapter 2 on the broad topic of Energy, Nelson lays out one way to calculate the results of exponential growth. Then at the end of the chapter, after all the citations, links, web sites, and questions for students, he throws in a bonus discussion on “order of magnitude estimates.” This is a topic I’ve included in my own books since 1983 and I am continually amazed by the number of people who don’t or won’t grasp this concept. I’d make this section of Nelson’s book required reading for most of the journalists and politicians I’ve come into contact with during my career—it would have save a lot of time. In the chapter on energy, Nelson succinctly explains exponential growth and the concept of peak oil—both forbidden subjects in North America universities. As a physicist, Nelson isn’t satisfied simply explaining the topic in words, he provides the formulas and works through the classic example of a 7% compound growth rate. At a 7% growth rate, the doubling time is only ten years whether for population or the consumption of natural resources, such as oil or coal. Anyone who has followed my own writing over the years will quickly see where I picked up my ideas when they read Nelson’s book. He has been teaching the importance of swept area on wind turbine performance for more than three decades. Nelson is an engaging and amusing lecturer. When I first heard him explain the basics of wind energy the light went on in my head and I’ve been preaching the gospel according to Vaughn Nelson ever since. Those new to wind energy should see Nelson’s section on innovative wind power systems. Nelson has include a few real gems, including Google’s Makani flying wing and one of Doug Selsam’s contraptions. As someone who was around in the 1970s, Nelson also has included some photos of novel wind turbines that were indeed novel even then. Nelson is as comfortable writing about specific yield as he is capacity factor. This is unusual for a North American. Most writers here are solely focused on capacity factor. Again, it reflects Nelson’s approach to the subject as a physicist. He even goes so far as to describe where you can track down actual performance data on wind turbines in the field that includes specific yield. Wind Energy includes a very helpful section on storage as it applies to integrating large amounts of wind energy into the utility network. Nelson includes several valuable graphics illustrating the energy density and discharge times of various forms of storage. This is the first time I’ve seen this all in one place. 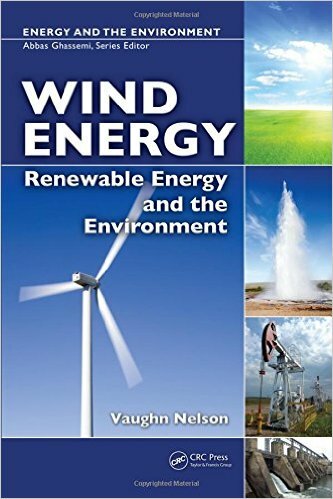 Wind Energy: Renewable Energy and the Environment by Vaughn Nelson is a book by one of the industry’s pros targeted toward students of engineering and physics. The book includes questions at the end of sections for use in an academic setting, reflecting Nelson’s many years as a professor of physics. Any serious student of wind energy should have Nelson’s book on the shelf. Similarly, any program on renewable energy in a department of engineering or physics at the university level should consider Nelson’s book as part of their course material or required reading. Nelson, Vaughn. Wind Energy: Renewable Energy and the Environment. Boca Raton, Florida: CRC Press, 2014. Second Edition. 328 pages. ISBN-13: ISBN-13: 978-1420075687, ISBN-10: 146658159X. 7 inches x 10 inches. $146 cloth, $80 rental, $105 digital. Country of origin not identified. The expansive title is appropriate as Nelson delves into such taboo topics as population, exponential growth, and exhaustion of fossil fuels.